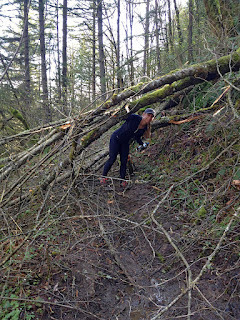 There were so many obstacles during this run-- That's my lasting impression. Downed trees, a stream crossing, snow (mostly not on the trail), oozing pits of mud. Even more than usual! Firelane 5 even had a few forks in it that we didn't expect. It was slow going, but felt good. I think having to stop and walk made the upped mileage feel really doable. Of course, we were both exhausted the next day! 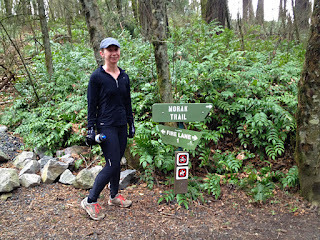 When I planned this route I was determined to fit in the Morak Trail-- one we've run past countless times but didn't get during last year's All Trails Challenge. In fact, we've never run it, although I knew it was only a tenth of a mile in length, I had no idea it connected until this; as an out-and-back it never compelled us. It was so thrilling to finally run this wee trail that we stopped for a photo opportunity. Despite the many turns, this route didn't feel too complicated. Holman from NW 53rd threw us off, so we ended up going too far on the road and having to turn around up a (steep!) hill. Oops. Other than that, I'd do this route again.